We had a great 4th of July, although I failed to take any pictures! Our city does a big firework show the weekend before the 4th of July. They do one Friday night and one Saturday night. So we hit up the Saturday night one this year. The kids loved it although parking was a nightmare for Dave and I. Brooklyn yelled "BOOM! OH WOW!" and clapped after each lull in the fire works. She was mesmerized. On the 3rd we stayed up until it was dark out and did a few little fire works in our driveway. The kids had fun picking them out with Dave. We had a BBQ on the 4th of July with Dave's parents and my brother Mike and his family. The kids had fun in the sweltering 100+ weather with water balloons and the sprinkler under the trampoline. We enjoyed chatting and letting Mike do his fireworks. 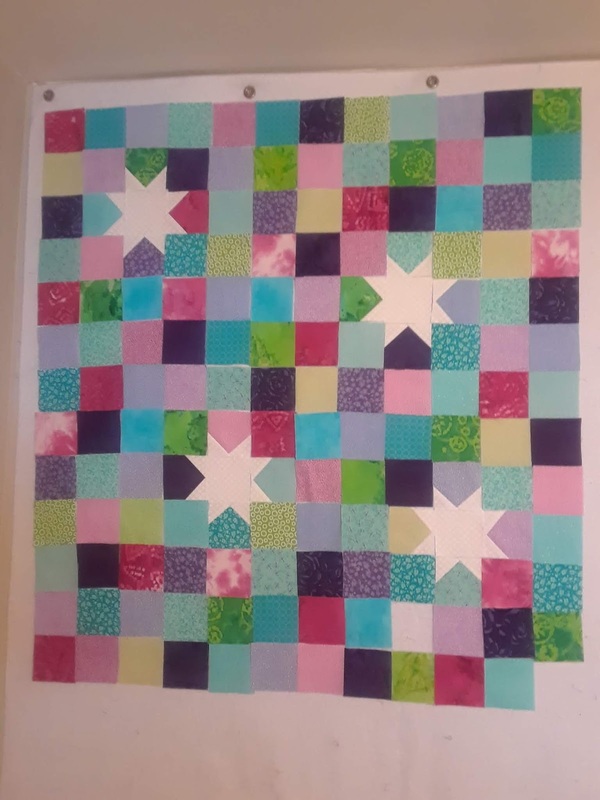 I've been working on a Quilt for Brooklyn's bed. I have about half of it laid out now (28 by 32 total 2.5 inch squares finished). It's way too big for my design wall and the boys kept destroying everything I laid out on the ground so here's hoping it turns out well in the end. Today as I was pinning squares I told Brooklyn the blanket I was making was for her and she told me "No, owls." So I asked her in confirmation "You want an owl blanket?" and she answered "u-huh." So I guess I'll be making an owl pillowcase or throw pillow to go with this blanket. Little miss opinion! 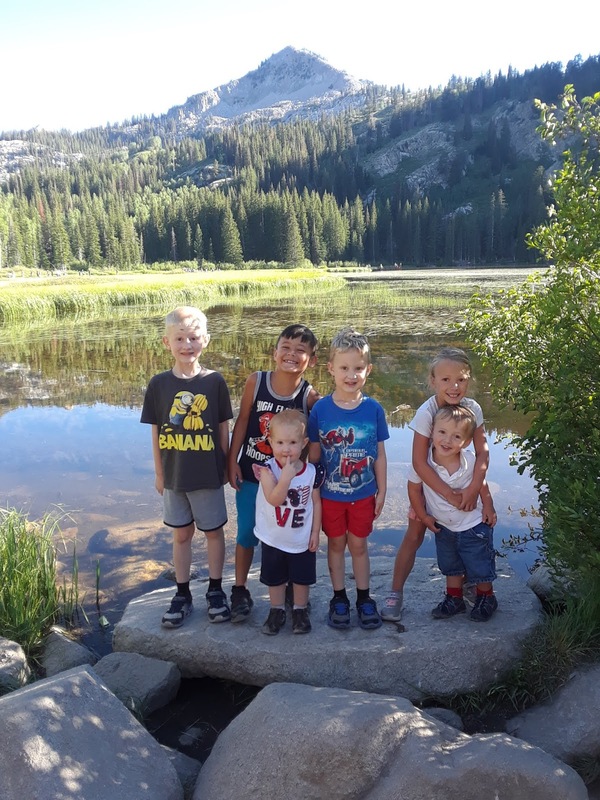 A few weeks ago we went on a hike with a family from our ward! The kids had a blast hiking with friends and we will definitely need to do it again. They ran back and forth and all over the place and totally crashed when we got home. Brooklyn has become meticulous with her toys! One of our neighbors was cleaning out her garage and gifted Brooklyn 3 cupie dolls. She lines them up by size, carries them around in her purse, and wraps them up in her baby blanket. 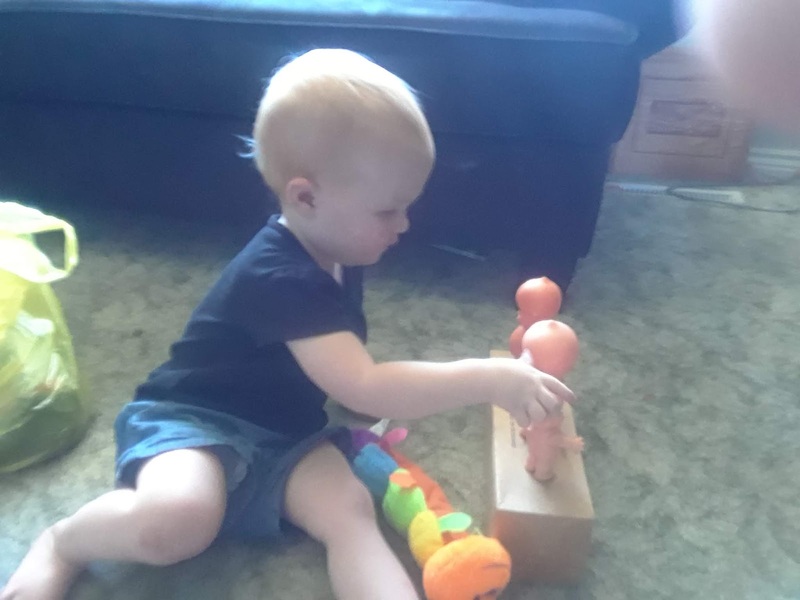 She also absolutely loves the caterpillar doll she bought herself at the Dollar Store. 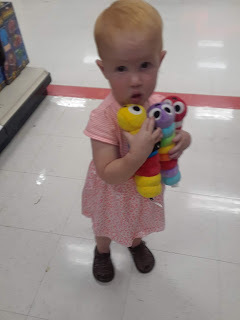 Speaking about caterpillars, we went to Target to get an idea of what Logan and Brooklyn want for their birthdays coming in August. Brooklyn carried these three around the whole store totally in love with them. I was going to buy them for her, but I checked the price... $20 a piece! Seriously?!? I think I'll head back to the Dollar store and buy her a few more for a buck. This week was full of fun activities and free stuff! 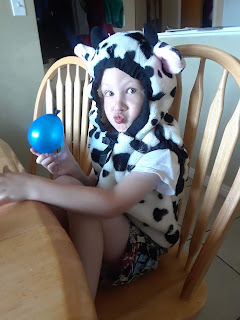 We celebrated dress like a cow day with free kids meals at Chick-Fil-A. 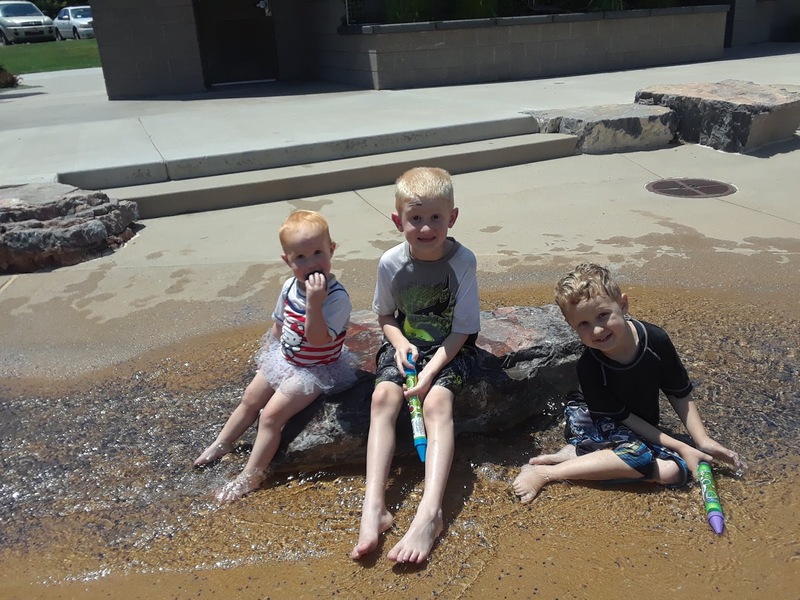 The kids loved dressing up, playing at the play place, and stopping by the splash pad after. 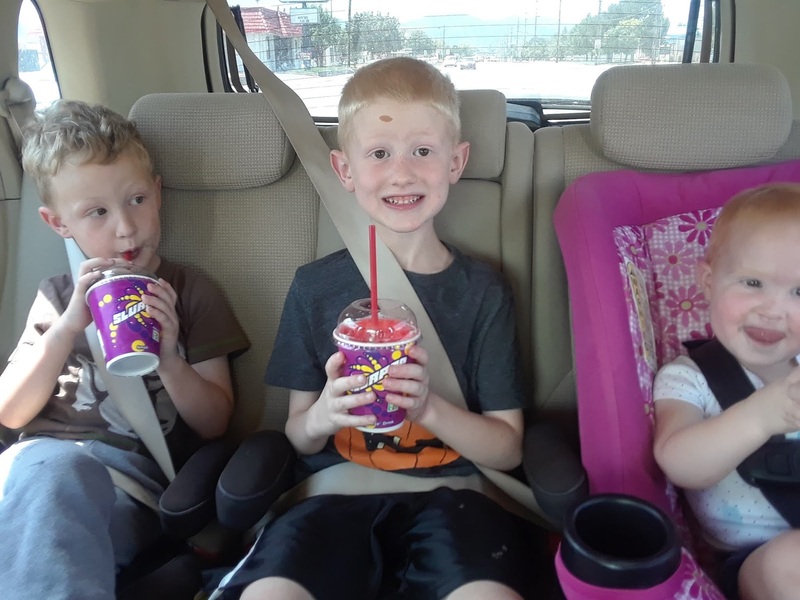 We celebrated 7-11 with free slurpees! If anyone ever asks you what a Captain Crunch slurpee tastes like, it is exactly like the cereal. I think it might be flavored with cereal powder. I highly don't recommend it. This week was full of pearler beads! Mostly we made Pokemon designs this week, but we branched out into venomous snakes when Logan's friend Briggs came over. Dustin also created a food line complete with pizza, hamburgers, and hotdogs. 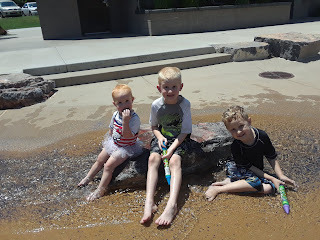 We've been at the splash pad a lot too! The kids love it, I love that it wears them out! I think we went 3 times last week. This week we only have two trips scheduled so far. Last week I started attending a Zumba class in the mornings at a near by church. The kids are pretty good and it's a great workout! Surprisingly there aren't other kids that attend, but they have fun playing piano and running around the church. Brooklyn spends about 20 minutes with me in between checking out what her brothers are doing. She always is back with me for the last 3 songs. The night Zumba class I haven't been to in three weeks reminds me of a mix of Latin Dancing and Hip-Hop. This class is more like Latin Dancing and Kick Boxing with weights. 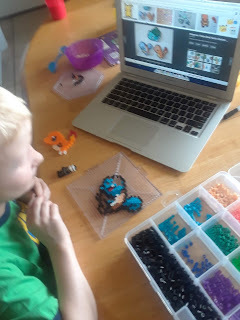 It's been good for me and I'm hoping to continue doing the class 3 days a week in the fall when Logan goes back to school. This has also been a week of minor electrical projects for me. Logan and Dustin complained that their ceiling fan made noises when it was on high "and we have to have it on high Mom!" so we took that one down and replaced it with a new energy efficient one. 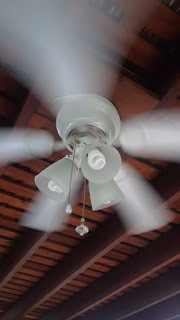 Since we had a functional ceiling fan we decided to replace the one on the gazebo which was a little broken and REALLY loud with the boys just a little loud fan. That one was a nightmare to take down and replace (it took me 4 hours), but those two are now replaced. Then one of the basement TV room lights got broken which meant we had to replace both of the ones in that room so they would match (they don't sell the style we had down there any more). I moved the unbroken one into the office to replace a really 80's wicker ceiling fan that we never used once in the 9 years we've lived here. Oh and I installed a new fire alarm in the basement. So I'm done with electrical for the next week... or until I can convince Dave we want to install canned lights in the living room upstairs. I really want that project to get done soon!